The Gale Force Connection » Mr. Dunn Goes to Montgomery | Who's Behind the Mask? — Among questions in an e-mail I sent Sept. 27, to Lance Brown, the executive director of People for Affordable Clean Energy, or PACE. 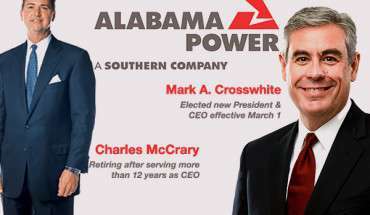 The following is a continuation of my research into connections between Alabama Power, the Montgomery-based political consulting firm Matrix LLC, and the use of third-party groups such as PACE to promote the power company’s interests before the Alabama Public Service Commission. 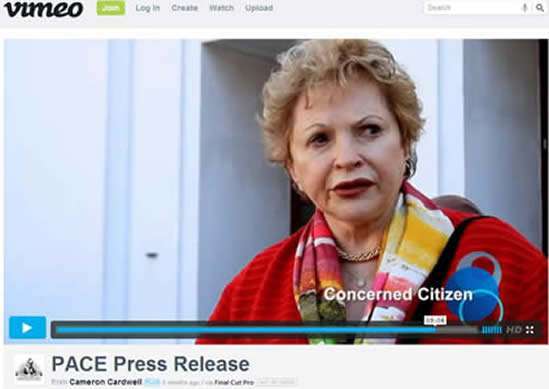 “Concerned Citizen” also appears in videos in which the Gale Force client is listed as 60-Plus. That’s a Washington-based organization which bills itself as a conservative alternative to AARP. In others in which she appears, the client is shown as Generation America, another self-described conservative alternative to AARP. And in at least one video, she identifies herself as a member of Generation America, but the client is listed as 60-Plus. 60-Plus implausibly claims to have 80,000 members in Alabama. If so, it would seem that it could drum up just a few of them and not have to borrow seniors from Generation America. What’s odd about her statement is that PACE, 60-Plus and Generation America and Concerned Citizen herself all oppose efforts by AARP as well as Commissioner Terry Dunn to reduce Alabama Power’s sky-high rate of return. Were such a reduction to occur, the power bills of the very people that “Concerned Citizen” professes to be concerned about would go down. Down, as in, less moolah out of your pocket each month, and less into the pockets of Southern Company shareholders. I’d never heard of 60-Plus or Generation America when I set about researching PACE. “Unplugged,” is a 21-minute video that argues that there is no energy crisis, but a political crisis. This crisis, viewers are told, has been brought on by environmentalists and policy-makers who seek to limit the use of energy sources like coal. The film is professionally done, with fine camera work and editing. There are interviews and scenes in Vancouver and Congress, as well as Alabama. The truly powerful message I got from UnPlugged was that cash was no object in the making of it. At the start, viewers are presented, Hollywood-like, with the names of the director and producers. They’re also identified on this classy credits logo. Below, one of many “production stills” from the “Unplugged” web site. It shows Charles Steele, who is interviewed in the film. Public records reveal that PACE paid the civil rights leader and former state senator from Tuscaloosa a total of $208,709 in 2009 and 2010 for work as a “consultant.” Steele spoke at one of the PSC hearings this year and, as always, played the role of Alabama Power cheerleader to the absolute hilt. Gale Force Productions, as I quickly learned, is a small, Birmingham-based company. Its web-site contained a link to its its page on Vimeo — a public video site similar to YouTube. The Vimeo site contained more than 80 videos. Some were personal but most were for commercial clients. Still images from all or most of the videos are also posted on Cardwell’s Twitter site. I was stunned at the number of videos by this small, little-known company that were connected to the subject matter I was investigating. There was, for example, a video of Lance Brown’s 2012 wedding, officiated by none other than Matrix founder Joe Perkins. There were Gale Force videos for Alabama Power; for PACE; for Generation America and 60-Plus. There were videos for JobKeeper Alliance, another non-profit that, like PACE, has advocated for Alabama Power before the Public Service Commission. Both of these one-man, Montgomery-based non-profits have — major coincidence no doubt — advocated very publicly in Mississippi on behalf of Alabama Power’s sister company, Mississippi Power, and related to matters before that state’s PSC. And both have bashed Alabama Public Service Commissioner Terry Dunn. PACE, to be fair, is a far gentler, more professional propaganda outfit than JobKeeper Alliance. Cagle is shown above in one of several Gale Force videos in which the client is listed as Walter Energy, the large Alabama-based coal company. A considerable amount of Gale Force’s work shows workers involved, directly or indirectly, in producing electricity, such as coal miners and power linemen. This shot above comes at the end of, “Always on for Life,” which has a young couple talking about an episode when having power was quite important. There are actually two videos with the couple. These two women — like “Concerned Citizen” — have appeared in almost all the 60-Plus and Generation America videos by Gale Force. This picture is not form one of Gale Force’s videos, but from video footage taken at one of the Public Service Commission meetings at which Alabama Power’s rates were discussed, and which Terry Dunn memorably called “Dog and Pony” shows. The two women, like lots of folks with ties to Alabama Power and its tag-along groups, were on hand to show their opposition to whacky liberals who want to lower your power bills. Rather, they support for the so-called conservatives who oppose lowering your rates. Among those self-proclaimed conservatives is a certain PSC president who posed with the two seniors for this lovely portrait. Below are screen shots from a Gale Force video called, “PACE-Dunn.” I suppose the title refers to the paying client (PACE) and the subject, Terry Dunn. Cardwell’s Twitter account shows that these two videos or versions of the same video were uploaded in the spring and removed in July. I wasn’t involved in this project at the time and as a result, never saw it. The cloudy background is similar to a number of videos that JobKeeper Alliance posted on YouTube and which were outlandishly critical of Dunn, and even Dunn’s chief of staff. The bottom panel — the one below the panel showing Gov. Robert Bentley — apparently comes from another iteration of “Dunn-PACE.” It shows, as you can see, a JobKeeper Alliance logo. Let me add that, if you find this confusing — 60 plus and Generation America, PACE and JobKeeper Alliance, this “non-profit” and that non-profit” — I do as well. Hopefully one day, I can provide you, to say nothing of myself, with a proper accounting of who paid for what and who all was involved. That day is not here yet, but I am trying. For now, I think it safe to say that they have shared interests, including the same small company making videos for them. Are you a customer of Alabama Power? If so, ask them about these groups. Maybe they’ll tell you what they won’t tell me. Below is a shot from a JobKeeper Alliance video blasting Dunn. I’m not sure who produced it, and am not saying that Gale Force had anything to do with it. In any event, some sneaky weasel wants We the Gullible Public to think that Terry Dunn is “cloudy” for wanting to lower our power bills. Other Gale Force videos are on behalf of political candidates and campaigns that use Matrix. Among them: Jefferson County circuit court judges Carole Smitherman and Jim Hughey. Below is a portion of one of Hughey’s campaign reports, showing expenditures to Brown, Gale Force, and Matrix — a true life trifecta. 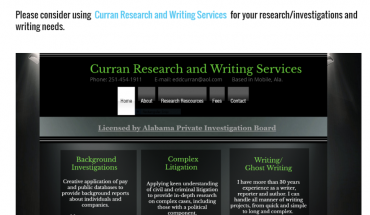 The Alabama Education Association is another major client of Matrix and Perkins. The top picture of the three below shows Montgomery lawyer Bobby Segall. It’s from from one of several ads Gale Force did to promote Amendment Four, a state amendment backed by the AEA. In the middle picture, Gov. Robert Bentley urges voters to support the jobs-measure, Amendment Two, that passed last fall. Matrix was paid hundreds of thousands of dollars to promote Amendment Two. And at bottom, and also from Gale Force, is nursing home company owner Norman Estes. He’s a major figure in the Alabama Nursing Home Association which, like the AEA and Alabama Power, is a Matrix client. For a number of years, much of Matrix’s video work was done “in-house” by Black Warrior Productions. That firm shared Matrix’s address and was incorporated by people who worked for or were associated with Matrix. Black Warrior has dissolved and the work it once did has apparently been farmed out to Gale Force Productions. The Gale Force video of Carter, as well as other videos on the Gale Force site, are included in, “Behind the Mask.” The short movie is an attack on pretty much every person or organization that has appeared before the Public Service Commission who does not blindly support Alabama Power. Terry Dunn is attacked as well, though subtly. In the event it’s not obvious, the name of the coal association movie is the inspiration for the name of this web-site. There’s some interesting history to Jimmy Carter and his allegations that will be discussed in the piece I’m working on. In any event, I was quite interested to see the ” Jimmy Carter” footage from “Behind the Mask” among Gale Force’s videos. As noted at the top of the page, on Sept. 27, I sent questions to PACE, including the one at the top of this page. That afternoon, I went to Gale Force’s Vimeo page to review one of the videos. The page was still there, but the videos — all but one or two — had been removed. Though some videos have since been added, none are related to the “clients” listed here. Cardwell’s Twitter page — which I failed to mention in the letter — shows that in November he uploaded three apparently related videos for 60-Plus and which, the titles suggest, were critical of AARP. However, they weren’t uploaded on a forum that allows public viewing. The removal of all those videos told me, if nothing else, that the recipients of my inquiries were paying attention to my one-man operation. When you’re working alone on a project you find encouragement where you can, and that was one such moment. 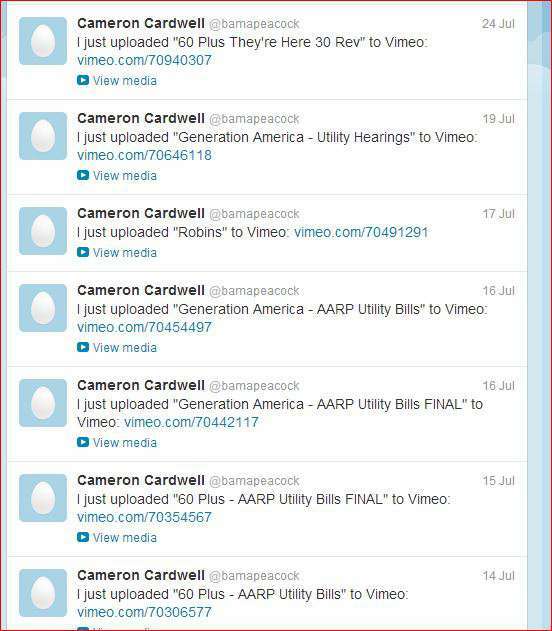 A portion of Cameron Cardwell’s Twitter page showing when he uploaded anti-AARP videos by 60 Plus and Generation America. If you enjoyed this story, and appreciate my research and the time spent on it and this project, such asgoing over and over through all those videos and web-sites, please consider making a donation.